The first teaser for Rogue One: A Star Wars Story has dropped, and it looks like we’ll finally be seeing the ‘wars’ that the title promised us a long a, long time ago. Once again it’s a female hero taking centre stage, enter Jyn Erso played by Felicity Jones, a rebel literally without a cause who seems to find a place in the Rebel Alliance’s struggle against the tyrannical Galactic Empire. 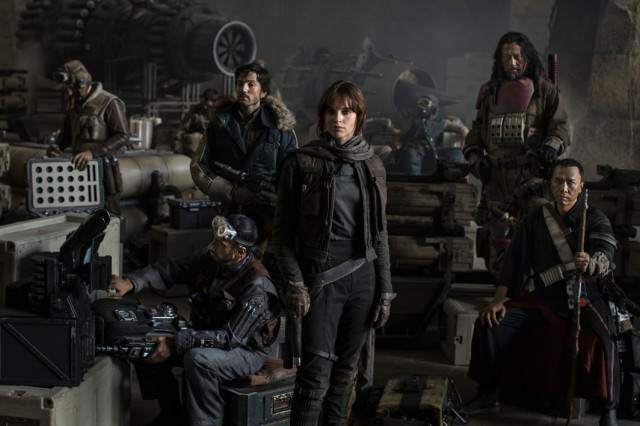 Rogue One will tell the story of a few brave resistance fighters banding together to go on a daring mission to steal plans for the Empire’s new super weapon, The Death Star. These events will eventually tie-in with the opening scenes of A New Hope, when Princess Leia is seen hiding the plans in R2-D2 before she’s captured by Darth Vader. The trailer also shows off a few new characters played by Diego Luna, Ben Mendelsohn and Oscar-winner Forest Whitaker. Interestingly the film seems to be heading in a completely different direction to previous instalments in the Sci-Fi franchise. And while The Force Awakens had a much more optimistic tone – fitting considering it was set after the fall of the Emperor – this teaser promises a far more sombre film, similar to a proper war flick as opposed to a traditional space opera. Seriously, this film looks like a pretty epic war film, and we see the rebels struggling against the seemingly unstoppable military might of Vader and Emperor Palpatine’s mighty storm trooper army, who for once seem able to shoot straight. Best of all though the trailer teases the return of cinema’s greatest bad guy, Darth Vader, and his iconic raspy wheezing breath can be heard in the trailers dying moments. The film’s due for release December 16 this year and I can’t wait!